Okay well it’s been a while since I’ve done a post and besides it being the holidays and me going on vacation to the most tropically warm heavenly place and having a hard time adjusting back to reality the truth is I feel like I live in the Arctic. I have lived in New England basically my whole life so I am not sure how I am so shocked at the freezing temps and endless snow we get, but somehow I am. Every year. And it’s the worst. Every year. And when someone lives in the Arctic it’s super hard to be fashionable. Because all you want to do is throw on some yoga pants and furry comfy boots and a big giganto thick sweater. Hmm…suddenly I am seeing the connection between my lack of a dating life in the winter as well. SO anyway, I said to myself, Maureen just do a post on yoga pants if that’s what you are wearing 24/7 in Jan./Feb. so BOOM here it is! Yoga pants, leggings, stretch pants, tomatos, tomahhhtos, call them whatever you want, but they are an amazing invention. They are comforable, versatile, fashionable, AND guys love when women wear them. These four things are almost never, like ever, in sync with one article of clothing. You usually get just comfortable and fashionable (think Uggs 5-10 years ago), or fashionnable and guys love (stilletos) or comfortable and versatile (a snuggie). I have been into stretch pants for as long as I can remember, I used to rock the purple ones with the stirrups in 2nd grade. Now I rock neon ones to Crossfit on the daily. These never really go out of style so go crazy and get all different kinds! Okay, don’t wear them with a unitard. These are sneaky stretch pants. If you touch them they feel just like stretch pants and they are as comfortable as stretch pants, but when you look at them they just look like black fancy pants. I think it’s the fake front pockets and back pockets that do it. In anycase I can wear these to work or take a nap in them, it’s awesome (or take a nap in them at work shhh ;)). Be careful though, don’t go wearing your half see-through leggings to work with a ratty T-shirt, people will notice, and by people I mean HR, and then they’ll have to have that “stop dressing like a homeless person” talk. Trust me on this one. HEY, not because I’ve worn that, because I’m in HR, k? You have to be tricky about it, get a little fancier pair of leggings/jeggings and have your shirt cover your bum a little or you might risk being a little too bootylicious for the office. 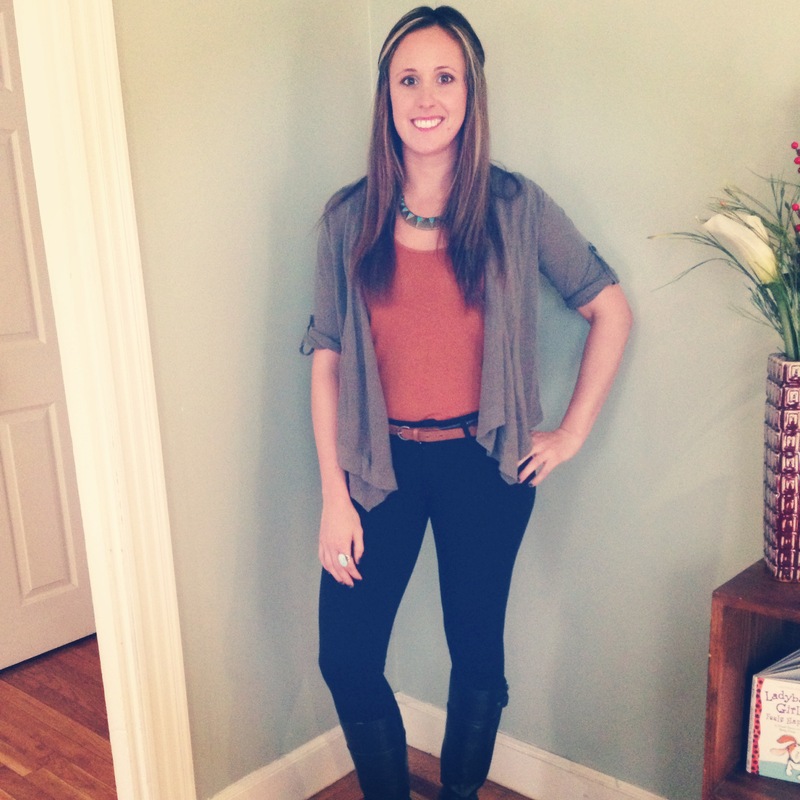 Black Leggings, Burnt Orange Jersey Tank, Brown Belt, Draped Cardigan, Black Riding Boots, Statement Necklace. MEOW. Whenever I wear these pants I feel like Catwoman. They are from Lululemon and I saw them online and before I could buy them they were sold out. It was really, really sad, *sigh*. #fashionbloggerproblems. Then like some sorta Christmas miracle, months later I went to the store and low & behold on the sale rack were THESE PANTS. I cried, and screamed, and then before they could kick me out for being completely crazy I bought them! They are SO rad, they have mesh cut outs and whether you are working out in them or working it with them you feel like a total bada$$. There are lots of appropriate leggings to wear out and about, pleather looking ones, fancier fabric ones, just something with a little extra sass. 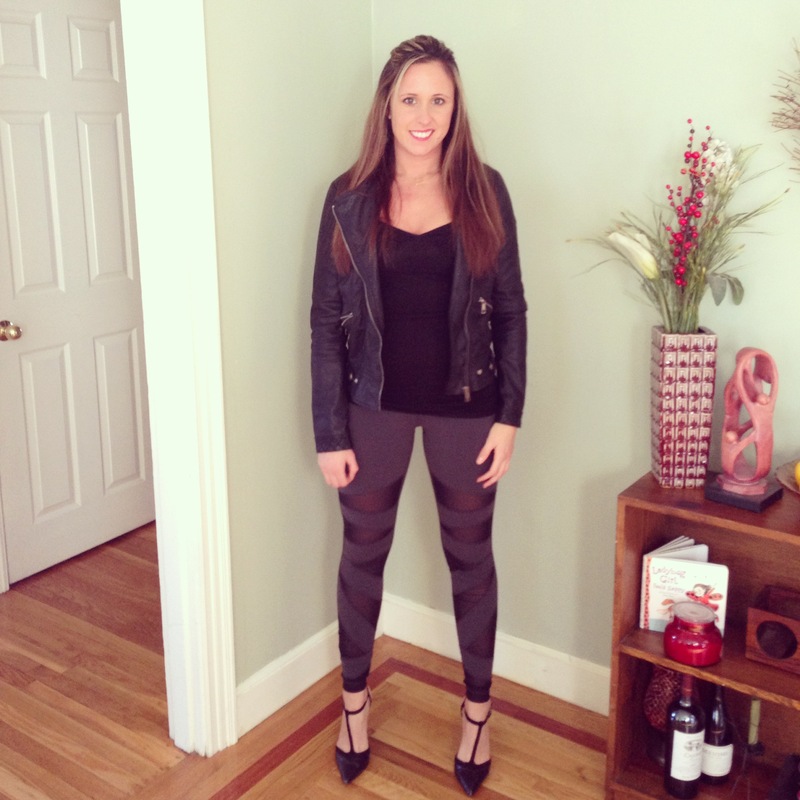 Yoga Pants, Jersey Black Shirt, Leather Jacket, Black Heels. These are conversation pants (what does that mean?). Meaning all kinds of random people and strangers on the streets will talk to me whenever I wear these. It’s actually kind of a blessing and a curse depending on the part of the city I’m in. I don’t think I need to tell many people how to wear leggings in a casual way, it’s something you probably do by mistake every time you wear them, that’s why I chose ones with a fun pattern to stand out a bit. I love wearing button down shirts with yoga pants, they give it a little structure and make you look a little less like you are hungover on your way to brunch at college. You can wear this outfit to the grocery store, straight lounging, or after you got into a chocolate sauce fight (don’t ask). 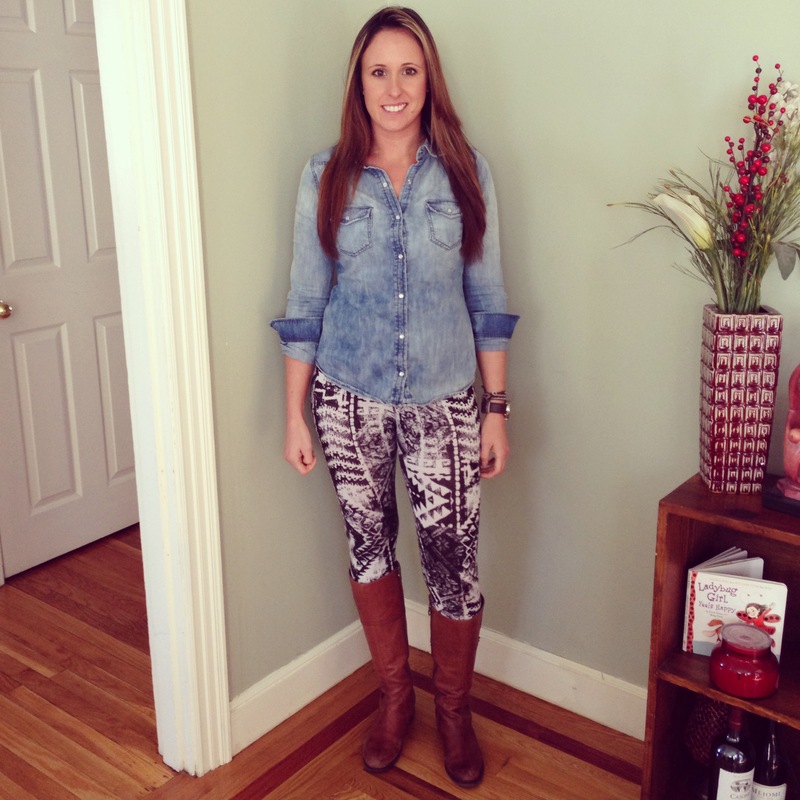 Aztec Leggings, Chambray Shirt, Chestnut Riding Boots. So hopefully for my next post it will be a beautiful Spring day where I can leave my cave and wear something not made of fur or sweater, but until then and basically until the end of time I’ll be wearing leggings and yoga pants and stretch pants. So do yourself a favor and go out and getcha self a pair, or 50!